The Sensaphone IMS-4000 is a stand-alone infrastructure monitoring system with an integrated voice and modem, an internal UPS, flash-disk storage, and a web server, in a simple-to-install 1U rack-mountable package. 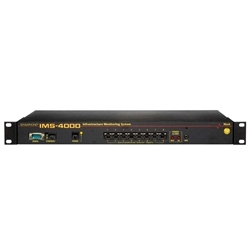 The IMS-4000 has 8 environmental inputs, monitors power and 64 IP addresses. Up to 31 expansion nodes can be added to one IMS-4000 host, bringing the network to 256 inputs; 2,048 IP addresses; and 32 power locations monitored. A PowerGate unit can be added to the host to monitor 8 more remote power locations. The unit and the expansion nodes each support one Axis M1011 web camera for visual monitoring. The internal web server allows you to check status via the Internet or by two-way E-mail. You may also call into the unit for a status report. Alarm notifications can be sent by voice call, text pager, E-mail, SNMP or fax. All Sensaphone dialers have non-volatile memory which protects the system memory even during loss of both AC power and battery. ARRA Compliant. Contact us for details. Average availability for the IMS line of products is 1 to 2 business days. -Expansion nodes can be added up to a total of 256 inputs; 2,048 IP addresses, 32 power locations.